Great student lounge and common area seating should not only be comfortable, but functional and flexible. Thinking about the type, the material, and the features of your lounge furniture before you make a purchase will ensure you make the right investment. Lounge or common area seating typically consists of sofas, chairs, love seats and end tables. 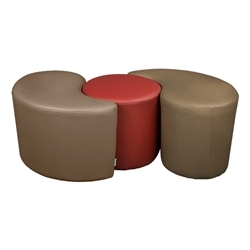 Beanbags, pods and other modular seating systems can be used as well. Whether you invest in sofas or oversized pods, seating that is comfortable, mobile and streamlined with technology is key. Studies have shown that this type of seating (that is, adaptable and mobile) promotes student creativity, focus and group discussion. Typically, lounge and common area furniture is leather, vinyl or fabric. Leatherlends a luxurious look and feel to your space. It's highly durable and often has extra padding, so it's comfortable to sit on for long periods of time. You'll pay more for leather than vinyl or fabric upholstery. High-end leather will develop a distinctive look and smooth feel as it ages. Vinyl is affordable and often available in a variety of textures and colors. It's easier than leather to maintain and keep clean. Vinyl isn't as durable as genuine leather, but it will withstand heavy use for a number of years. It's great for student-heavy areas or spaces with food and drink, but can be hard to repair if it cracks or tears. Fabric upholstery includes linen, microfiber, pure cotton and more. It is generally soft, comfortable and available in a variety of patterns and colors. Be sure to double check the type of fabric on your lounge furniture; certain types may require specialized cleaning or maintenance. Consider what types of features you'd like your student lounge furniture to have. Do your chairs need locking casters, so students can easily move about the space and collaborate on work? What about arm tablets? 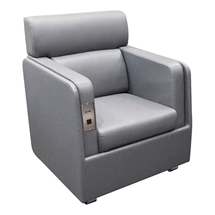 Lounge chairs with arm tablets give students a space to write, plus long-term comfort. End tables, chairs and even soft seating with electrical and USB outlets is another great option for lounges. This allows students to plug in and charge their devices on the spot.